BY SUE ERWIN – Every minute, 19 people become victims of identity theft … and only 20 percent of people who experience monetary fraud report it. Lee County Sheriff’s crime prevention staff visited Boca Grande on Wednesday, April 25 to discuss common scams that people could easily fall prey to if they’re caught off guard. 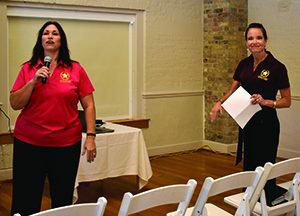 LCSO Crime Prevention Specialists Michelle Sargis and Heather Turco discussed current tips on how to avoid scams that area residents have experienced since 2017. In 2016, Florida was third in the nation in fraud complaints. Some of the situations discussed included common phone scams, in which a person claims he or she is calling on behalf of a company like a bank or even the Internal Revenue Service, asking for personal information and bank account information. “Unless you initiate the call, you should hang up immediately when someone asks for this information,” Sargis said. The “grandparents scam” and the “Microsoft scam” were other popular ones discussed. Turco discussed “Phishing” – spoof of a business or government agency that you know and trust using email or the internet, and “Smishing” – text messages that are spoofed and designed to bait phone users into texting or calling back with personal information. The two specialists discussed other cons, including romance scams, free sweepstakes and lotteries, and buying online scams reported from using Craigslist and fake employment websites. Signs of a scam can include generic greetings like “Dear Customer” or an urgent request to respond immediately. The top five ways credit card information is stolen are from data breaches (noting the recent Facebook situation, where user information was shared), card skimmers, emails and phone calls. Sargis suggested that you should never use a debit card at a gas station, because if a skimmer is placed on a payment device, the thief will have immediate access to your checking account and possibly your savings account. Ways to reduce your risk include checking your bank statement regularly, getting copies of your credit report and shredding your mail. You are entitled to a free copy of your credit report every year. Contact Experian, Equifax or TransUnion to get your copy. You can also contact the credit bureaus and request a credit freeze on your accounts. Lt. Jeff Corkhill and Dept. Chris Nebel were on hand to take questions from residents after the presentation. If you became a victim of identity theft, you can call the Lee County Sheriff Office’s fraud prevention team directly at (239) 477-1242. You can contact the IRS Identity Protection Unit at (800) 908-4490.